AMHERST, N.Y. – Speaker of the New York State Assembly Carl Heastie will share his vision on creating education, training and employment pathways for the state’s youth as Daemen College’s Distinguished Leaders Lecture Series speaker at 3:30 p.m. Oct. 20 in the Wick Campus Center’s Alumni Lounge. The event is free and open to the public. “We are honored to have Assembly Speaker Heastie come to Daemen to talk about providing education and employment opportunities for youth in communities across our state,” said Daemen President Gary A. Olson. Heastie was elected speaker of the New York State Assembly in 2015, making him the first African American to serve in this important role. He has been one of the Assembly’s staunchest advocates for children, education, housing, after-school programs, and job training for youth. 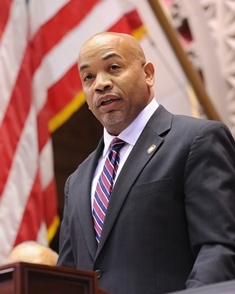 Heastie earned a master’s degree in business administration with a concentration in finance from Bernard M. Baruch College, and a bachelor’s degree in applied mathematics and statistics from Stony Brook University.